Let Recreation Creations Inc. maximize the play value of your playground with age-appropriate Early Childhood Structures. Designed to cultivate young, rich imaginations, these fun zones are bursting with colorful climbers, slides, crawl tubes and panels. Check out the "Tot House," "Trike Track" and creations for water and sand play—a virtual imagination bonanza. Representatives are devoted to assist you in planning a custom play area that will have eager youngsters begging to visit. Recreation Dynamics offers a heavy-duty, compact swing set perfect for little ones. Made from 3 1/2-inch O.D. galvanized iron pipe, it comes complete with two black commercial rubber belt swing seats with steel inserts for added strength and vandal-resistance. 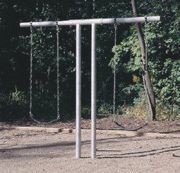 Includes galvanized playground chain and 8-foot top rail. Powder-coating, seat and chain upgrades available. Includes easy online ordering and free shipping in the continental United States. 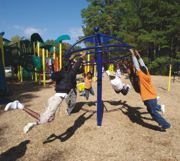 Kids need shade on the playground to filter out harmful UV rays. New from Kidstuff Playsystems is the model 6600ss with a built-in 18-foot-by-18-foot sun shelter. The 6600 includes many of the most popular features for your preschoolers—two slides, a safe snake climber, crawl-through tunnel, balance beam and two great play panels. The sun shelter filters out 95 percent of UV radiation and reduces the temperature up to 20 degrees. It is engineered to withstand winds of up to 120 miles per hour. Introducing EvosTM , the inventive new play system that changes the shape of play as we know it. Evos is so unexpected that it stops kids in their tracks. "Where should I begin?" With no prescribed entry or exit points, Evos leaves play routes to the imagination. "What are those things for?" All-new components present untold possibilities. Kids love Evos because it challenges them on so many levels, all at once. Its innovative, spherical shape immerses kids in an environment where play is possible in every direction and dimension. Inventive play components beg to be explored—mentally, physically and through countless new games. GameTime takes movement to the next level with an exclusive new product. The Sky Runner is available with a tilted or straight upright, providing a thrilling ride for several children. Grab the outer rail, get a running start, push off as you lift your feet, and go for a spin. The tilted version provides an up-and-down motion as kids circle; the straight version keeps them on an even course. A mini Sky Runner is also available with a straight upright to accommodate smaller groups. Sky Runners teach cooperative play behaviors and help develop grip strength, upper-body strength and overall coordination. 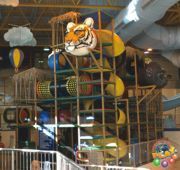 International Play Company manufactures a quality line of indoor play structures and outdoor playgrounds. From start to finish, design to installation, IPC's professional and knowledgeable team will work hand in hand with your team to develop a proposal that meets the needs and budget of each individual project. IPC understands the significance of designing play spaces that address the various stages of a child's development. Age-appropriate equipment is essential to ensure that every opportunity for play results in a safe and positive experience. IPC adheres to ASTM, CPRA, IPEMA, CSA, ROSPA and ADA safety guidelines, and ships worldwide. Designed specifically for toddlers' gripping range, muscle strength and balance, the Apex Climbing Attachment provides full-body support that developing young children need. The Apex Lateral Links and Attachments provide endless climbing possibilities that simulate real rock climbing. Since the gripping areas are not predefined, the Apex encourages children to use their creativity to find routes either laterally from deck to deck or up and over to the other side. In a natural rock climb, the path is different every time. The same factors apply to the Apex, making it the height of climbing for today's youth. 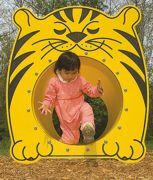 Playworld Systems' Adventure Series provides fun and challenging climbing obstacles with pieces that can be mixed and matched to create a custom-made adventure course any kid will enjoy. Children will experience a challenging full-body workout as they leap, climb, balance and swing from one obstacle to the next. Made of rope, steel, stumps and logs, Adventure Series structures will stimulate kids' imaginations with creative shapes and test problem-solving skills as they decide how to maneuver the course. Structures come in a variety of sizes, shapes and colors, and can be configured to fit any outdoor space.